The show’s 23rd season centers on Colton Underwood’s awkward, drama-filled, and all-caught-on-camera quest for love. ABC announced its lineup of 30 single women vying for Underwood’s heart (or at least a national platform to launch a career as a social media influencer as past contestants have done). Alex Dillon, a graduate of UMass Amherst, confirmed on social media that yes, she does have a real job. Still, in brief clips from the first night of the show’s taping, one of the contestants is dressed in a full-body sloth costume — head included. Our money is on Dillon being in that costume. Along with the announcement on Instagram, Dillon used the hashtag “#slowandsteady” (like a sloth, get it? ), but it’s safe to assume that Dillon gets sent home fairly early in the season if she’s already on social media. The show is still taping and contestants are reportedly not allowed to use any social media, or phones for that matter, until they get sent home. Per ABC’s policy, Dillon was not allowed to speak to the Globe for this story. “Anyone on this season will not be available for any interviews until after the episode where they are sent home airs,” Amanda Arcangel, a representative from Warner Bros., said in an e-mail. Underwood, a former football tight end, appeared on Season 14 of “The Bachelorette,” which wrapped up last spring. 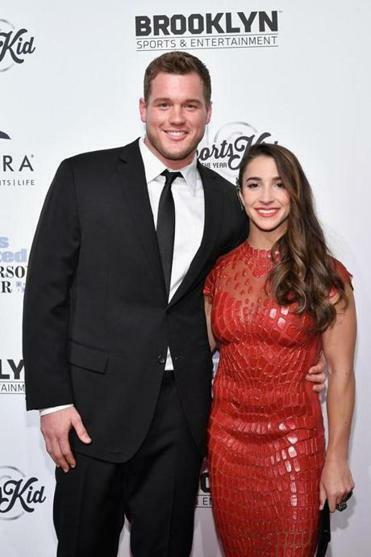 Before going on the reality show, Underwood dated Olympic gymnast — and Needham native — Aly Raisman.